Last week, a huge announcement went out that had repercussions the world over. No, I’m not talking about the new Pop announcement (though that was important to many people as well). I’m speaking about the announcement that Google will be closing down Google Reader. For many people, Google Reader was a daily stopping point in their Internet travels. I used it to keep track of over 100 different websites. I could have spent an entire day checking each site for updates and saving the ones I was interested in reading later. Instead, it would take me about an hour to go through many of them. I could also prioritize. I’d typically read the web comics sites in the morning (favorites such as Bug Comic, Saturday Morning Breakfast Cereal, Sheldon, and XKCD) followed by some geeky websites. I’d also go through a long list of blogs to find articles I was interested in and mark them to be read later. Had Google Reader not been around and I needed to go to each site manually, I’d likely have quit reading most due of lack of time. I likely would have frequented only a dozen or less websites instead or would have checked sites but not looked back to see postings I missed. Thanks to Google Reader, I could read more in less time. But now that’s going away. What’s a RSS-addict such as myself to do? I heard of a couple of alternatives, namely NewsBlur and Feedly, but initially had trouble with them. You see, not only did I hear about them, but thousands (if not millions) of other people heard about them at the same time. We were all rushing those alternatives and their poor servers couldn’t handle it. I could hardly blame them. For years, Google Reader was *THE* go-to place to manage your RSS feeds online. Other feed readers lived in their shadow for so long that they didn’t need to up their server strength. With Google Reader on the way out, though, they’ve been beefing up their servers. After trying both, I think Feedly is my new feed reader. Newsblur was nice, but Feedly just seems to have a few extra features that help make my feed reading. Specifically, while looking at an item in my feed, I can load it in a web browser right within the app and, when I am ready to read the next item in my feed, simply swipe to move on. With Google Reader, I used to have to launch my phone’s web browser (separate from Google Reader) and then go back to Google Reader to move on. Feedly isn’t perfect, mind you. The main categories are in different colors and widths for no discernible reason. In addition, I’m still at the mercy of another company. If Feedly decided to shut down six months from now, I’d be back at square one. Ideally, I’d like to host my own feed reader. I might still do that, but until I find a script that suits my purposes Feedly will do everything I need a feed reader to do. Did you use Google Reader? If so, what are you switching to? 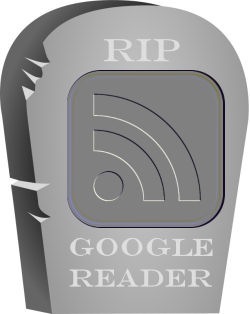 NOTE: The "RIP Google Reader" image was created by combining Halloween Rounded Tombstone by cgbug on OpenClipArt.org with an altered version of the RSS feed icon from Wikimedia Commons.